The Bond Slam – a second peek inside. The triennial conference is this year located in Munich. With 1500 participants and six parallel sessions, this report can give only a flavour of proceedings. Edward Valeev talked about the scaling problem in coupled cluster theories, the so-called gold standard for computing the energy and properties of small molecules. The problem is that the number of basis functions N describing the atomic basis set for the atoms scales from between N6 to N10 in terms of computer time, with similar behaviour for the memory required for the calculation. He described methods based on natural pair orbitals and localisation schemes which can achieve linear scaling, ie N1 for the energy, quite a break through! Using reasonable basis sets, CCSD(T)-like energies for molecules with 100s of atoms were reported. During the Q&A time afterwards (the tight schedules associated with so many speakers means questions are often limited to 1-2, with very short answers) a question was posed about the prospects for first and second derivatives for the method. This means that e.g. reaction mechanisms can then be probed with unprecedented energetic accuracy. The answer was non-committal, but if these derivatives do arrive, it will revolutionise our ability to understand mechanisms. Which brings me nicely to Jeremy Harvey, who talked about calculating accurate overall rate constants for complex mechanistic cycles. The rate equations are solved for the steady state condition and include concentrations of all species and the energies are obtained using CCSD(T)-F12 theory (a modification which allows better basis set scaling without increased computation time) as single point geometries. He described an example where the barrier associated with a postulated mechanism was about 6 kcal/mol higher than derived from the observed rate. This was sufficient to induce them to explore alternative mechanisms, which were indeed located with an appropriately lower barrier. I have used the value of ~10 kcal/mol as my mechanistic test on this blog, and it’s really nice to see this value being reduced further. Yet again this theme emerged with Yitzhak Apeloig, who asked about the mechanism for C=Si bond rotations in substituted systems recently made in his group. The energy of this rotation is low enough to be observed in NMR spectra. But when the energy of C=Si bond rotation is computed it comes out about 10 kcal/mol too high. Again alternative mechanisms were explored and it turns out that a 1,2 migration from R2C=SiR2 to form a carbylidene species, R-C-SiR3, rotation and then 1,2 again to reformulate the R2C=SiR2 system came up with the goods. Peter Scheiner talked about how attractions between molecules can be induced by dispersion. He described how Ph3C-CPh3 is an unknown molecule (dissociating into Ph3P• radicals) but when 4,6-di-tert-butyl groups are placed on all the phenyl rings, the dispersion attractions between them can account for ~60 kcal/mol (! ), more than enough to stabilise the system. I have already described some of this work in a post here. The prospects are very exciting for more dispersion-stabilised molecules to emerge. During Q&A, a question was posed about what other atom pairs other than H…H might be brought into ultra-short contact by these attractive dispersion forces; we may expect further examples to emerge in the near future. Ken Houk gave a fascinating glimpse into the post-transition state world of reaction dynamics, as applied to Diels Alder cycloadditions and Cope rearrangements. The reactions are characterised by the residency times of the dynamic trajectories in the region of the transition state as short (~4 fs), medium (20-40fs) and long (80+fs), these times mapping on to what we used to call “synchronous”, “asynchronous” and “stepwise”. A good example is the so-called bis-pericyclic reaction of cyclopentadiene where the trajectories pass through a transition state but then bifurcate into two (in this case) equivalent pathways. He discussed other examples where the trajectories follow either a 2+4 cycloaddition pathway or a 4+6 alternative pathway and how the number of trajectories for each can be influenced by either solvent (water) or an enzyme. Ken described several 20-40fs trajectories as corresponding to “dynamic stepwise” reactions, which during Q&A was suggested are equivalent to the term “hidden intermediate” pathways coined by Dieter Cremer and as revealed in many posts here from the intrinsic reaction coordinates or IRCs. This is a clear growth area and expect many more examples of reaction dynamics to be applied to many exciting systems in the future. Leo Radom talked about very simple molecules, H3CX and the effects on the bond dissociation energy (BDE) of the C-H bonds if the group X is either strongly or weakly protonated (the latter via a hydrogen bond), or deprotonated (again strongly or weakly via a hydrogen bond from hydroxide anion). This is important in several enzymic pathways, where the CH bond might be activated in a similar manner by the enzyme. He also talked about similar effects on the ionisation potential. I noticed a connection between this theme and what might be called the electron affinity of H3CX. If you want to see what the connection is, go visit the Aachen bond Slam, about which I have previously blogged! I will stop with an observation that all the notes above were taken in real-time during the talks, which all emerged as Powerpoint slides, having an average residency time on the screen of perhaps 1-2 minutes each. References were invariably given as full journal citations (authors, journal, year, volume, pages) rather than as DOIs, and given the time constraints I did not try to capture them. Hence the lack of citations above to the presenters’ work. The slide displays are traditionally not made available to audiences‡ and photography of the screen or recording is considered very bad form. Conferences are not really about FAIR data, which I have described often on this blog. I hope these six examples give one flavour of what is happening at WATOC 2017. If another interesting collection emerges, I may describe it here. ‡But see e.g. doi: b9r9 for an Aachen talk. This entry was posted on Tuesday, August 29th, 2017 at 7:00 am and is filed under Interesting chemistry, WATOC reports. You can follow any responses to this entry through the RSS 2.0 feed. You can leave a response, or trackback from your own site. 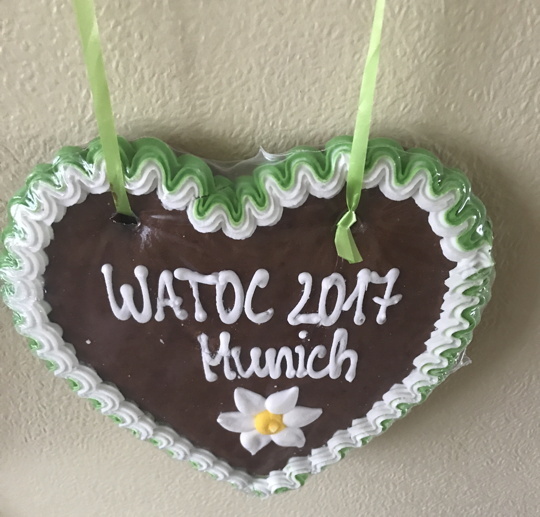 WATOC 2017 report. is licensed by Henry Rzepa under a Creative Commons Attribution-Noncommercial-Share Alike 3.0 United States License.